In 2006, the NASG underwrote a run of a Sunkist citrus shed kit in S scale. The story behind this kit, manufactured by Showcase Miniatures, is just one example of how a new product was brought to S scale. It’s a recipe that others have followed successfully, and you can do it too. I live in the Sacramento area of northern California, along the original transcontinental right-of-way built by the Central Pacific Railroad (which became the Southern Pacific). In the first half of the 20th century, the area was one of the largest producers of pears and plums. Each year between 1953 and 1956, the SP handled more than 10,000 carloads of pears and 2,500 carloads of plums. Almost all this fruit was transported by the SP in Pacific Fruit Express (PFE) refrigerator cars. The S scale model railroad that I’m planning is based on this industry. To this end, I’ve been researching how the fruit was processed for PFE shipment to distant markets. Generally, the fruit was picked in the orchards and transported by truck to packing sheds located on sidings along the SP right-of-way. Once at the packing sheds, the fruit was graded, washed, wrapped, and packed into crates. The crates were then loaded onto pre-cooled PFE reefers for shipment. 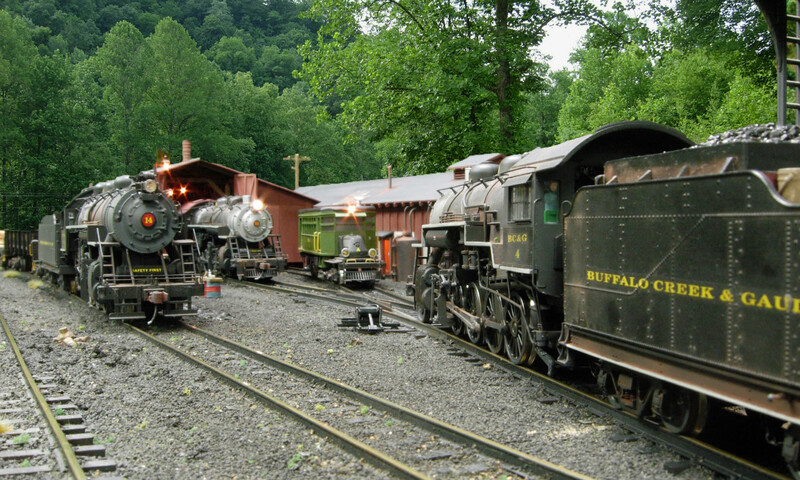 To replicate this traffic on my railroad, I will need to model several of the area’s packing sheds. My research has located photographs of several of the packing sheds that I intended to use as a guide to scratch-build or kit-bash these buildings. However, I’ve been unable to locate pictures of all the packing sheds. So I’m always on the lookout for suitable model structures to use in the meantime. 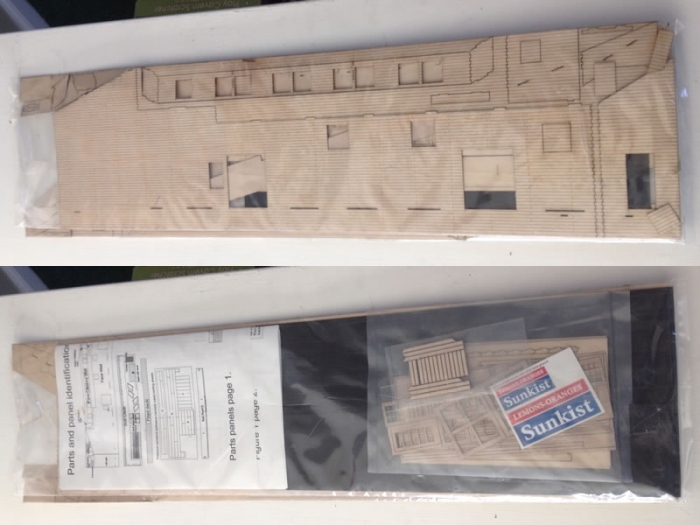 In September 2005, one of the Yahoo e-groups that focus on the citrus industry announced that Joe Warren, owner of Showcase Miniatures, had just released an HO laser-cut low-relief building kit based on the Sunkist San Fernando Heights Orange Association packing house. I Googled the Showcase Miniatures website to take a look at the kit, and was immediately impressed. I thought it would work well for my purposes as built and as a base for a kitbash. I also thought the structure could double as a warehouse or an industrial building. I contacted Joe Warren to see if he would be agreeable to producing the kit in S scale, and if so, what he required for production. I was pleasantly surprised when Joe enthusiastically responded that the kit could be easily converted to S scale and that he was interested in producing the kit if I could guarantee 50 orders. We discussed the size of the finished model and the estimated cost. One of the advantages of this project was that I knew I could front the cost of the entire project, and thus guarantee the minimum numbers Joe required to do the work. Once the preliminaries were completed, I set about gathering orders for the project. I advertised the kit on the S-Scale and S-Trains Yahoo e-groups. I also got promotional pieces printed in the “NASG Dispatch,” the “S Gaugian,” and “1:64 Modeling Guide.” If I were doing this project today, I would also advertise in the S Scale Resource and of course on the NMRA S Scale SIG Forum. In about a month I had 25 orders. Then in October, NASG President Sam McCoy contacted me to discuss the project’s history and to see if I had any commitments for orders. Sam then told me that NASG Board of Trustees might be interested in investing in the project and wanted to know if I would be willing to turn the project over to the board. I quickly agreed, and the NASG board approved the project. The plan was for the NASG to buy the initial run of 50 kits for sale to NASG members, and to handle the logistics regarding these orders. The NASG Board assigned Western VP Gerry Evans as project manager. I turned everything over to Gerry; then all I had to do was wait for the building kits to be produced. After Gerry worked with Joe Warren on some minor modifications, the citrus shed kits were rolled out in the summer of 2006. It’s very important that the manufacturer wants to produce a product for S scale. Joe Warren was looking for a project to test the S scale market; I was lucky enough to approach him at this time. It really helps if the item has never been produced in S scale before. For example, I thought the citrus shed could also double for a machine shop or a warehouse. When I was gathering reservations, I found that I was not the only person who thought that way. Customers were also telling me the same thing about the potential to use the building for other uses than a citrus shed. A new project has to be aggressively promoted in every venue read by S gaugers to get the word out and the orders rolling in. THIS IS VERY IMPORTANT!! Many projects fail because the vendor can’t figure out how to reach us! You have to have thick skin because some folks like going negative and are going to tell you every reason why the project will not succeed. Even worse, these Negative Nellies will want to share their opinions, which can hurt the project as well as put a negative light on S scale in general. I was lucky that the building caught the eye of the NASG Board and that they picked up the cost and logistical work for the orders, but I was prepared to buy the whole run because I wanted the building. As such, I had to be prepared to do whatever was needed to sell what I did not need. For example, I knew that I would likely have to sell several kits to the hi-rail crowd. So I was prepared to offer a built version (which I was going to build). Fortunately, thanks to the NASG, I did not have to offer kit-building services. I am glad to see that this process is still occurring in S scale and that people are taking the initiative to bring new products to S.
A couple of other examples are worth noting. S scale New York Central fan Ed Loizeaux noticed that Model Memories was producing very delicate photoengraved brass kits for HO models of the graceful cantilever signal bridges that were the standard along the NYC’s Hudson Division. Ed negotiated a minimum order quantity with Model Memories (MM) and got his signal bridges. Ed’s personal requirement met the minimum; however, MM continues to offer these S scale kits in its inventory. For a long time, American Models (AM) offered its rib-side twin coal hopper cars in only one NYC livery – black. The black color scheme appeared on the prototype after the time frame that I personally model (1955). I needed a freight car red version within a particular car-numbering range. I asked AM’s Ron Bashista if he would to the red version, and if so, what was his minimum order quantity. His answer was yes he would, with a minimum quantity of 25. So I polled the Yahoo S-Scale e-group’s members for interest and came away with commitments for 27 red hopper cars. AM then produced the cars, and afterward added them to their standard product line.